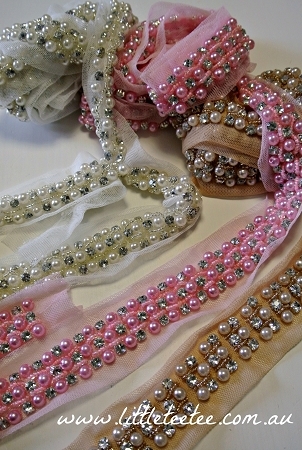 This new diamantÃ© and pearl trim can be added to any garment to add a stunning finishing touch to your creation. Three rows of coloured pearls, interspersed with clear diamantÃ©'s, have been securely fastened onto the mesh base. Sweet little clusters of coloured beads run between the rows of pearls & diamantÃ©s. Simply sew along the mesh base, keeping close to the embellishments, then trim the mesh off when finished. There is enough mesh on either side to sew into the seams of your creations. Size: Each embellished section is approximately 2cm in width. Total width with mesh is approx 4cm. Colours: As shown - champagne, pink and white..
Pre-cut into 2yard lengths - approx 190cm. Care: We recommend your items be placed in a wash bag, and please do not place in the dryer.